There is detailing on both sides of this brass Greek coin. On the reverse is a scene from a chariot race. 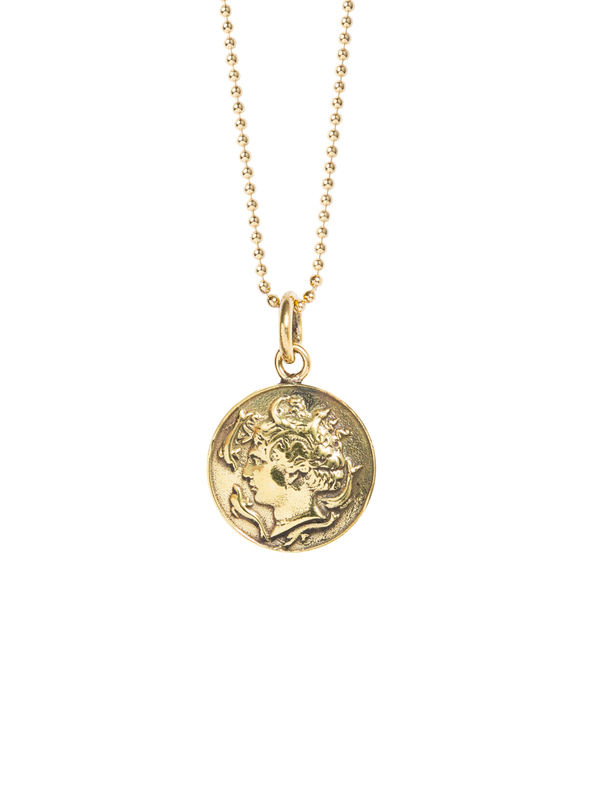 The coin hangs on a 60cm sterling silver ball chain which has been plated in 23.5k gold. A stunning classic linked necklace, that would dress up any outfit and add total style. The chain measures 45cm in length and 1.5cm wide Its hand made in bronze and then gold plated with 2 microns or 18ct gold in Birmingham. The quality of the workmanship is second to none and we offer a 2 year guarantee for the plating. Obviously we advise avoiding all contact with water and perfume. If the necklace is out of stock then lead times are about four to six weeks, We can also make them to any length so please get in touch to discuss your specific requirements. Give fashion basics attitude and edge with this awesome gold arrow necklace. Team with leather or lace, denim shirt of dinner jacket to instantly emit a spirited rock n roll vibe. The large gold plated arrow measures 6cm in length and hangs on a fine gold 80cm ball chain. The chain is made of sterling solid silver that has been plated with 23.5KT gold. Timeless, chic and elegant, what more do you want from a necklace! It feels utter heaven on and will inspire any outfit. It is hand made in bronze and then gold plated with 2 microns of 18ct gold in Birmingham. The quality of the workmanship is second to none and we offer a 2 year guarantee for the plating. Obviously we advise avoiding all contact with water and perfume. If the necklace is out of stock then lead times are about four to six weeks, We can also make them to any length so please get in touch to discuss your specific requirements. This solid sterling silver crown key brooch measures 4.5cm in length and has an oxidised finish.